No one ever regrets buying quality! At Tarlan Technical Ltd your fire is built for you - a truly hand crafted excellence. The "Little Cracker" is an attractive, compact and functional solid fuel heater especially designed for camper vans, caravans, boats and other similar, smaller enclosed environments, from 9 sqm to 100 sqm. 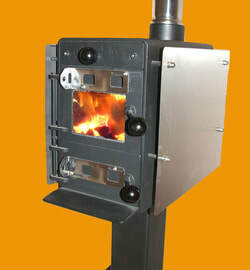 Multi fuel or Wood burning. The Multi will run on coal, wood, compressed sawdust logs, pine cones etc BUT not drift wood, the salt in the wood will destroy the firebox. The Woody will burn wood, compressed logs, pine cones etc. 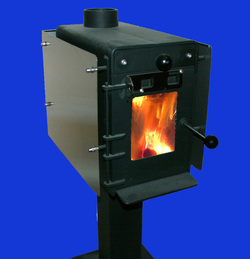 Solid fuel provides a safer, dryer and more effective heating option than L.P.G. or diesel, your motor home will amaze fellow campers with dry windows! Customers have told us that this unit will boil water faster than an LPG stove. Even on medium heat the fire top runs at 220 deg C! Both the Multi-fuel and the Woody come complete with a stainless steel flue kit, which consists of the top cowl and sleeve, 2 m flue, ceiling plate and a spacer. For installation into dwellings we can supply longer flues and quote necessary flue components as needed. Note: This Unit is NOT Clean Air Approved. Lab tested 7.5 KW coal and 6.5 KW on soft wood! If you are looking for a multi fuel oven visit here !